ensemble ɛkstʁaktə stands for a new type of ensemble. Taking their cue from the insight that we live in post-exotic times in which many musical traditions prosper and proliferate in a way that ignores geographic, ethnic and ideological limitations and world orderings, the musical cosmopolitans of ensemble ɛkstʁaktə want to explore and examine the musical potential of traditions they know – as well as traditions alien to them. 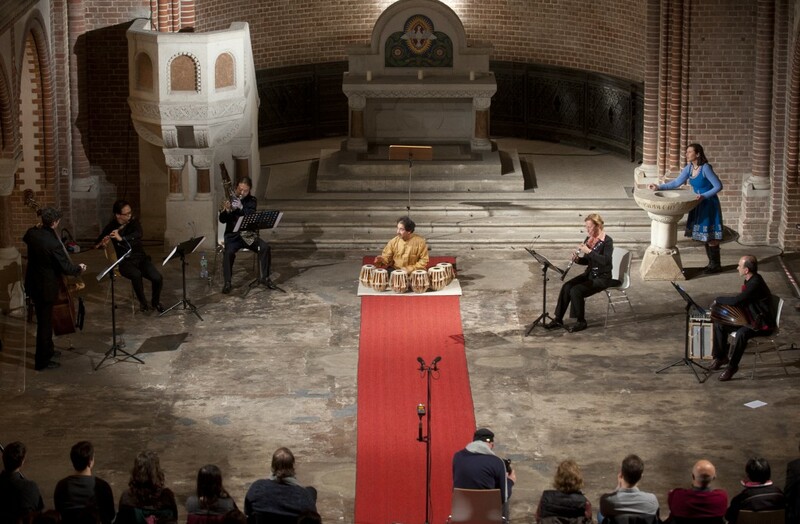 In ensemble ɛkstʁaktə concerts, listeners can catch the exciting moment when forms of music making, ideas, musical concepts from many origins interlock and open up new ways of experiencing music. During our rehearsal and research, every musician is asked to question everything within their own tradition: their relation to a single pitch, to scales, to rhtyhms, but also their relationship to the audience, how one tunes one’s instrument, how one communicates with co-musicians. In all this, ensemble ɛkstʁaktə is completely free to choose the means appropriate to its ideas – whether it is a memorized rule system for structured improvisation or an interactive onscreen score, whether conventional notation or verbal instructions, whether graphical scores or flowcharts, whether light signals or head nods. We are only interested by 2 questions: What have we not yet heard? and Is it truly arresting music ? This inter-traditional approach is so new that there are essentially no repertoire pieces – at most, we can adapt open concept works. Also, the usual commissioning framework seems inadequate to our work, as each piece must be developed from of the virtuosity, tradition and conceptual skills of each individual musician. Thus ensemble ɛkstʁaktə will mostly present works that have been developed in intensive workshop and research processes from ideas and concepts proposed by members of ensemble ɛkstʁaktə, especially by its artistic director Sandeep Bhagwati.